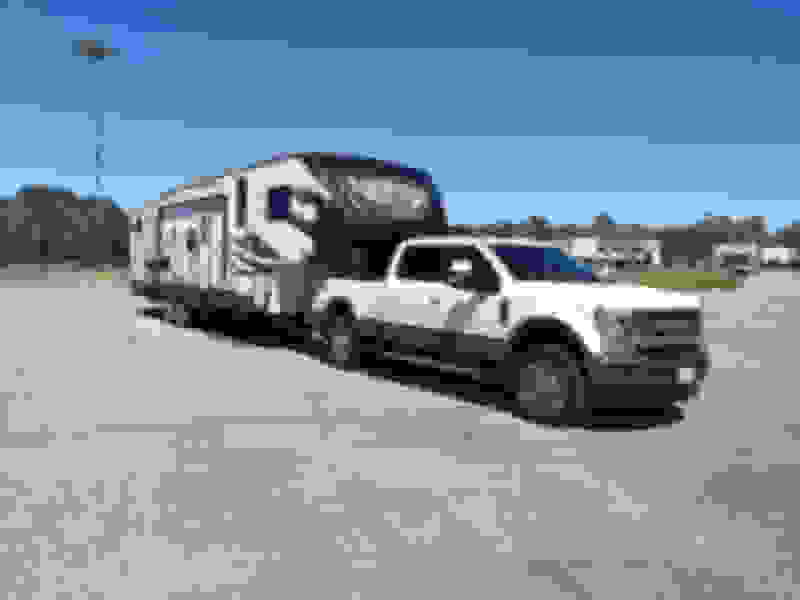 We just pulled our fifthwheel trailer for the first time with our new f250 crewcab, (regular tow package) and it wiggles or moves around more than I expected. It requires a fair bit of steering corrections and not sure if this is normal or is it the michilen tires or? My previous pickup was a 2014 Ram 2500 and it drove very straight, sometimes if the road was perfect you could forget there was a trailer back there. Now it had the coil link rear suspension with a sway bar, maybe that kept things tighter. I am not saying this truck is bad, just not quite as good as I think it can be. What 5th wheel? Hitch setup? 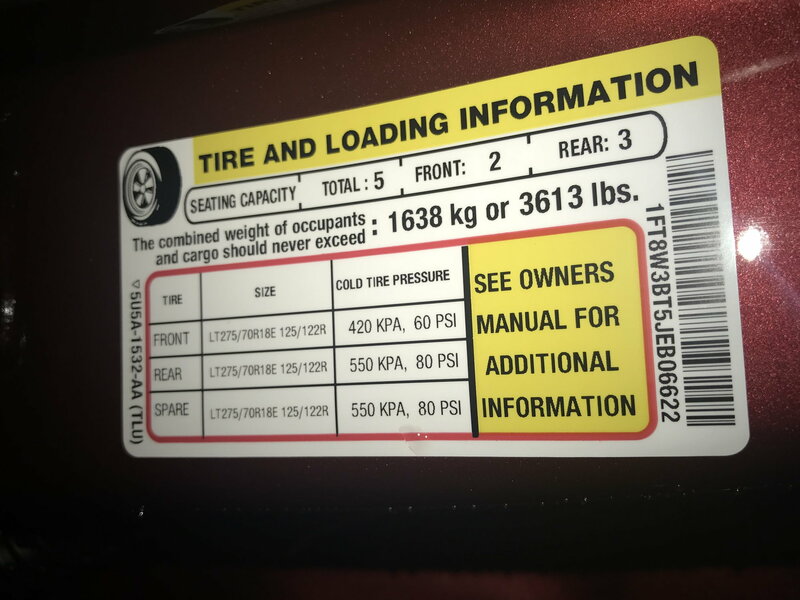 What are you running for tire pressure in the rears? I had the same thing when I was running 65 PSI. Went away when I up the pressure to 75 PSI. Is the trailer level when hitched? It is a 39.5' heartland, weighs 12000 loaded with 2000 or so of that on the pin. All tires are at 80 psi. X2 and how is the weight distribution in the trailer? Same roads, time of year, wind conditions? Are your tires inflated properly, is the trailer suspension in good condition, any spring /suspension parts broken, or worn out? Short box or long box trucks, is the hitch point in the same place over the axles in both trucks? Did the previous truck have air bags? The trailer is level to a tad high at the front, very close to level. All the heavy stuff is middle to upfront. Trailer is in perfect shape. The ram had the five link rear suspension with coil springs. I will say it was a stiffer ride. What is the GVWR of your truck F250? It looks like you have the 6.7 diesel. Also, what's the payload capacity of your truck? It will be on the yellow sticker inside the drivers door identified as "The combined weight of occupants and cargo should never exceed". You could be close to your payload capacity if not over with that combination. The front tires shouldn't be at 80PSI. My 2018 F350 XLT CC 6.7 states 60PSI max for the front tires. My Buddy has a 2017 F250 XLT CC 6.2 Gasser and pulls a Keystone Hideout 298BHDS fifth wheel. I believe his fifth wheel is 35'5", GVWR 11,500 with a hitch weight of 2300lbs when fully loaded. I believe his payload capacity is around 3100lbs. With the weight of his passengers/hitch/ gear, he still had roughly 100lbs of payload remaing and his F250 gasser pulls it perfectly. I am 400 pounds over the max payload when full of fuel. When another pickup is passing you, once they get to the front bumper, I have to counter steer as the air pressure changes off the front of the truck. Things like that didn't bother the ram, but I never had new michilen tires, bf ko2's. The truck is brand new, 500 miles, so maybe it is in the tires, the new soft tread is making it squirm and I am correcting for that. Could be that simple. It very well may be the tires. My 2018 F350 and my Buddy's 2017 F250 both have the Goodyear Adventures. We took a trip together last year to Myrtle Beach from Cincinnati, Ohio. He was new to the whole fifth wheel towing thing and was super impressed how rock solid his F250 pulls his fifth wheel. Have you checked the tire pressure on your Hearland? It very well may be the tires. My 2018 F350 and my Buddy's 2017 F250 both have the Goodyear Adventures. We took a trip together last year to Myrtle Beach from Cincinnati, Ohio. He was new to the whole fifth wheel towing thing and was super impressed how rock solid his F250 pulls his fifth wheel. Have you checked the tire pressure on your Heartland? Trailer tires are at 80, Checked them before we left. And I always take the bypass around Cincinnati! Are you sure about those weights? Have you had the rig across the scale and done the math? 12,000 lbs. is extremely light for a 39.5' fifth wheel and 2,000 lbs. is light on the pin weight for a 12K gross. For example, my 36' "mid profile" fifth wheel is 13,980 loaded with 3,000 of that on the pin. Besides the tire advice above, I'd double-check and confirm your weight information. Most 39' fifth wheels are too much trailer for a 3/4-ton truck. Maybe 80 is too much in the truck tires also and is making it worse. I could try that, they are rated for 3750 pounds each at 80 psi, so that is 7500 pounds, almost the entire weight of the truck with just two tires. The front weighs 4750 with me in it, so I could easily run 65 psi.